Every year, during the month of October, we turn our attention to all things pumpkin — pumpkin-spice coffee, pumpkin cookies, pumpkin bread and, of course, Jack O’Lanterns. But how many of us ever stop to think about how pumpkins came to be associated with all things October and Halloween? The pumpkin actually has a fascinating history, one connected to the traditional harvest and folklore. It makes sense that pumpkins would be associated with fall, as it’s a fall harvest food. Originally from Central America, pumpkins date back over 7,500 years. The first pumpkins didn’t look a lot like the pumpkins of today. Those were small, harder and not nearly as sweet. But pumpkins had nutritious flesh, stored well and could last all winter, so people began to cultivate them. Native American tribes relied on pumpkins for food and introduced them to early Colonial settlers. According to PBS Food, the first pumpkin recipes began to appear in New England in the 17th century. By the 1800s, sweet pumpkin dishes were a standard part of holiday meals in New England. Pumpkins as Jack O’Lanterns have an equally interesting history. People have been carving pumpkins for centuries, but most of us don’t know where the tradition comes from. According to the History.com, the tradition begins with an Irish folktale about a man named Stingy Jack. Apparently, Jack convinced the Devil to have a drink with him one night, but because Jack was stingy he didn’t want to pay for the drink. So he convinced the Devil to turn himself into a coin, but when the Devil did this, Jack put a silver cross next to the coin, which kept the Devil from being able to turn back into himself. 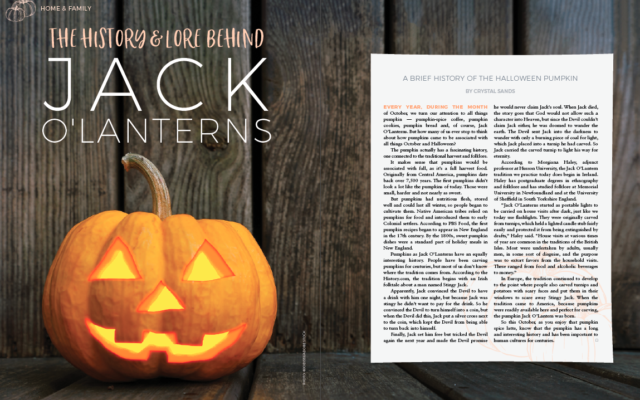 According to Morgiana Haley, adjunct professor at Husson University, the Jack O’Lantern tradition we practice today does begin in Ireland. Haley has postgraduate degrees in ethnography and folklore and has studied folklore at Memorial University in Newfoundland and at the University of Sheffield in South Yorkshire England. In Europe, the tradition continued to develop to the point where people also carved turnips and potatoes with scary faces and put them in their windows to scare away Stingy Jack. When the tradition came to America, because pumpkins were readily available here and perfect for carving, the pumpkin Jack O’Lantern was born. So this October, as you enjoy that pumpkin spice latte, know that the pumpkin has a long and interesting history and has been important to human cultures for centuries.